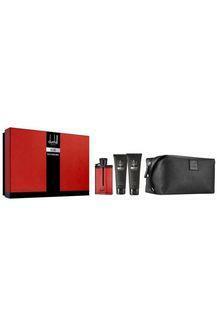 Bring home this grooming kit for men that will spoil you with a luxurious feel from the house of Dunhill. It has an exotic aroma that arises from the spicy and woody fragrance notes, which are further accentuated by the accords of black suede and kaffir lime for a captivating scent. It contains after shave balm, eau de parfum - 100ml, bag, shower gel that makes it more appealing. If you are searching for a utilitarian grooming kit, get your hands on this pack of an eau de parfum, an aftershave balm and a shower gel that comes in a nice bag.